A chilly March evening run in the rain….or plodding out the miles! So, it is one month to go today to the London Marathon, and I imagine that most of my fellow marathoners are just about to start tapering down as they have probably just put in their longest run, or they are about to this weekend – (a good way to run off those chocolate Easter eggs that I always tell myself that I won’t eat!). Not me, nope I am finally just picking up my mileage as my training finally begins to look like it is taking some sort of shape. And this evening after work I managed to convince myself despite the cold drizzle that it was better to go for a run instead of straight home. So, as commuters were heading in all directions along Westminster Bridge, I started out for the Royal Parks. My first mile through St James’s Park and up along Green Park is always a bit of a plod, and a stop start at all the lights and crossings until I get to Hyde Park, and then I begin to relax and start to find my stride. My aim was to go cover somewhere over 13miles this evening, and so as not to make the run too monotonous, my first lap was around the outside of Hyde Park and Kensington Gardens. There’s a street at the bottom of Kensington Gardens that is seriously more like millionaires row, but it slopes gently up hill so quite frankly it could be a hovel for all the distraction it lends. I always then enjoy the stretch along Bayswater – there’s something about running along against the flow of traffic that always makes it feel like I’m running quite fast…I wasn’t, although I think that was possibly my paciest mile. As I turned back into Hyde Park and down the Park Lane side there’s always that desire to head straight for home as I reach Hyde Park Corner, but I was good and gritted my teeth and turned the corner and covered another two laps of Hyde Park, back over the corner and round Green Park, a lap round St James’s, and along the river up to Vauxhall Bridge, over the bridge and along the south side of the river back to St Thomas’s. Bleurgh, I heard my watch bleep and glimpsed it but in the dark I misread it and thought I had only just about covered 12 miles, so my delight was quite substantial when I reached the door and it read roughly 16 miles! I startled a patient covertly smoking in the shadows as I whooped loudly. It took me roughly two and a half hours or there abouts…so only another ten miles to go, and roughly another hour and a half of running – if I can keep a consistent pace. I fear that from about 16 miles onwards my pace is going to become a bit more ploddy. But you never know what can happen in the next four weeks. As I’m building up towards London instead of tapering down to it I’m intending to peak for it perfectly on the day (unlikely, but I’m being ever so optimistic), and also simply regard it as a long old training run for the Atacama Desert which is growing slowly in the back of my mind as October creeps ever so much closer! Adding on 4 miles cycling home in cold wet rain wasn’t quite as much fun as running in it, it has to be said, especially when about 10 mins into cycling home I realised I’d left my wallet at work. But I’m home now, mildly regretting that I have arranged a training session with Jon tomorrow morning at 8.30am, I’m sure I used to have more energy a few years ago and back to back training sessions evening followed by early morning seemed like a fun idea! Right now I am questioning my sanity. Still, 4 weeks to go, and after tonight’s run things finally feel like they are progressing. After all the niggling setbacks, not to say my time at The Third Space gym coming to a rather abrupt and somewhat unprofessional end, (a long story for another entry if I can be bothered, suffice to say at this juncture that after giving 12 years of dedicated hardwork which I passionately believed in training others for races from 5k to 100miles to mountain and desert races, to be told 1/2 an hour before what was to be my last class that I was being “let go” was a little peeving, not to say lacking in any sense of professionalism & respect – but I won’t dwell on that now), it has been a tough training route so far. I just hope that the next four weeks are smooth and obstacle free. 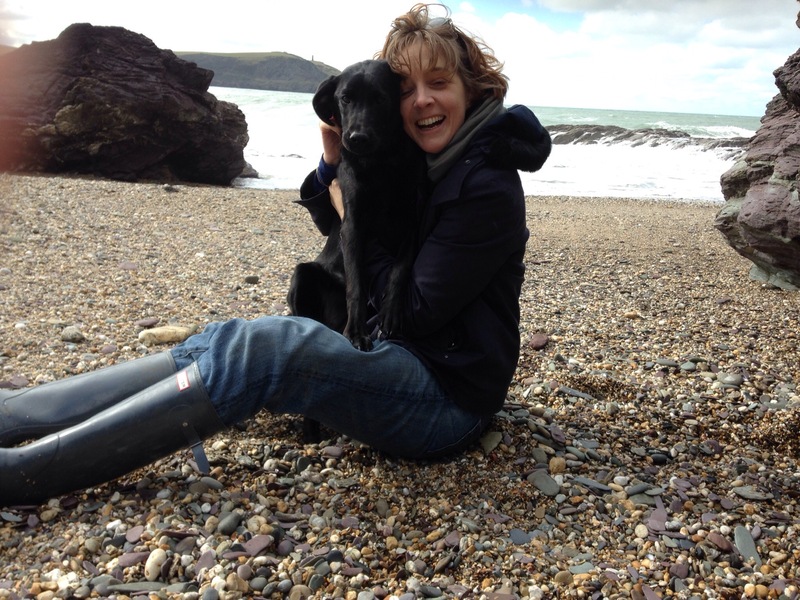 So I’m back in Cornwall for a week’s holiday with my wonderful Mummy. 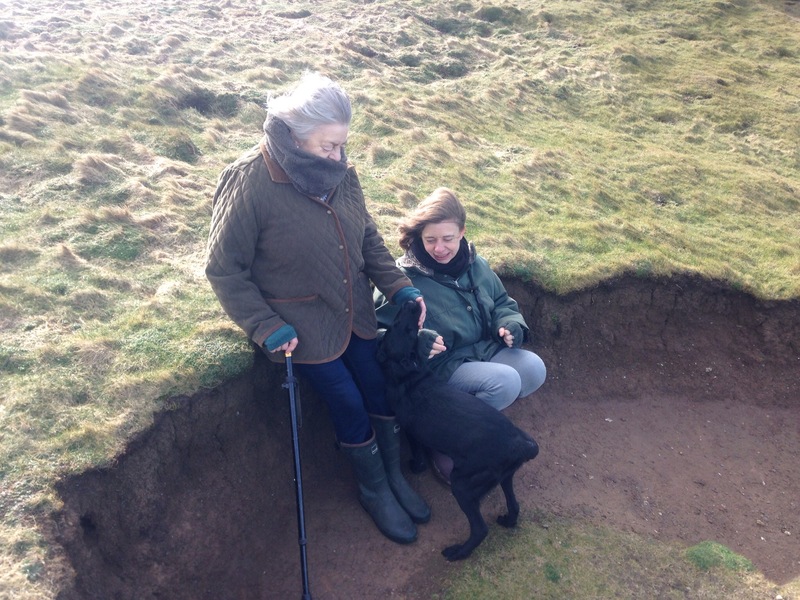 We came down on Friday afternoon with Skye (my mother’s Labrador puppy) and and my somewhat reluctant cat, Monkey – I say reluctant as trying to persuade her to go in the catbox did leave me looking like I had just crawled through several yards of sharp barbed wire. We drove through all four seasons to get here and arrived in chilly rain, only to find that the key was not where it was supposed to be. 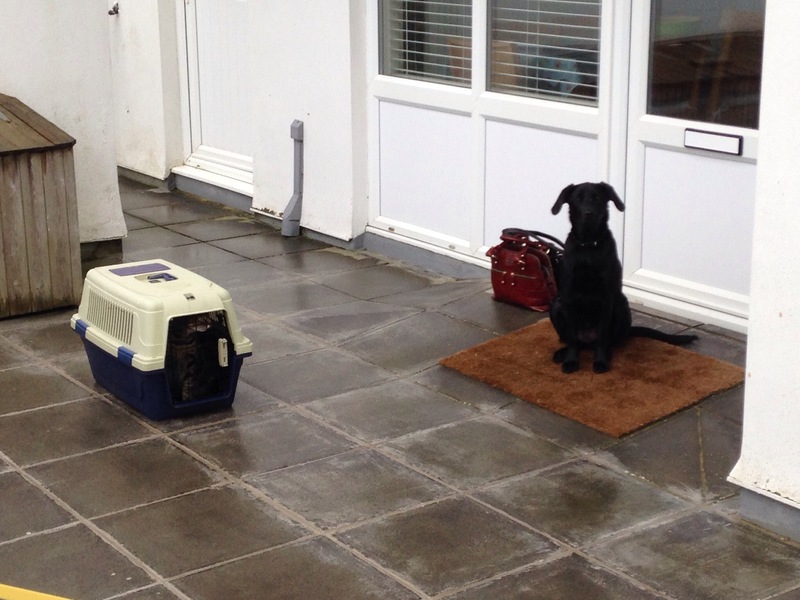 Having already unloaded said catbox from the car, it seemed cruel to confuse Monkey by putting her back into the car as we waited for Katrina, the lady with the key to turn up…..Skye and Monkey were both rather mystified as to why Mum and I continued to sit in the car whist they sat outside the door…. 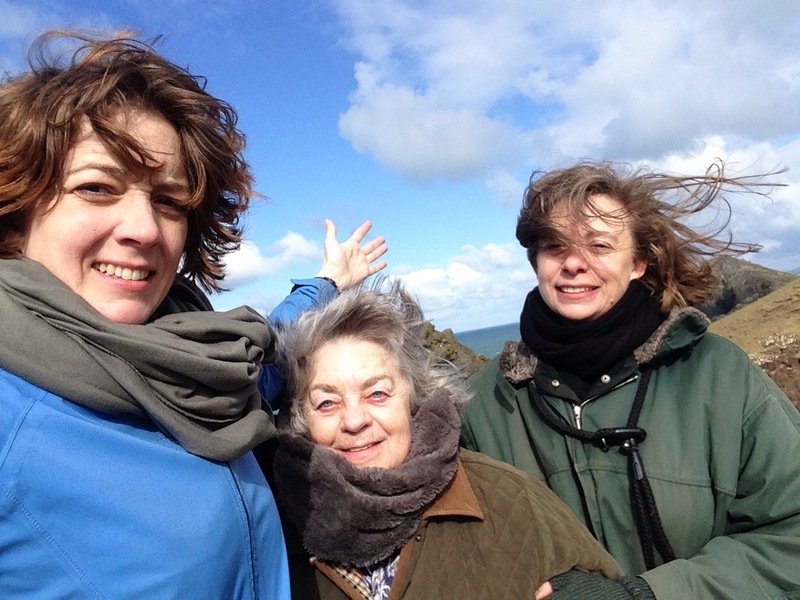 We eventually gained entry into the lovely cottage, Nantucket within the Highcliffe Holiday Cottages in Trebetherick, tea, shortbread and log fire soon ensued, and a few hours later my sister arrived. So instead, we headed out on Saturday in bright beautiful Cornish sunshine to the Rumps at Pentire Point to wave a cheerful springlike hello to our old dad – for those of you that don’t know, my sister and brothers and I and my mother, and even Skye as a tiny puppy, brought Daddy’s ashes out here in December on his birthday and cast him off the cliffs into the turbulent seas below – in fact we all nearly went with him due to it being the same day as Hurricane Desmond. 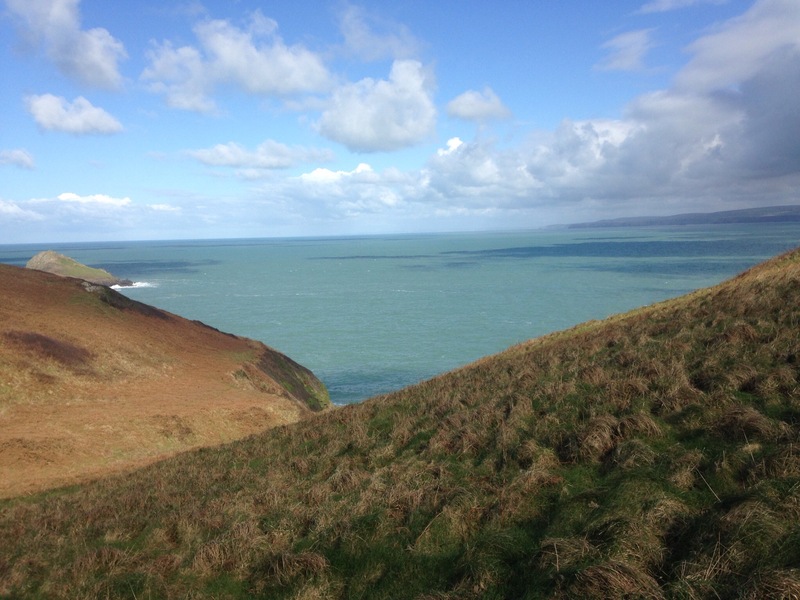 This time it was bright sunshine, still windy but with a turquoise sea swelling in the background…. 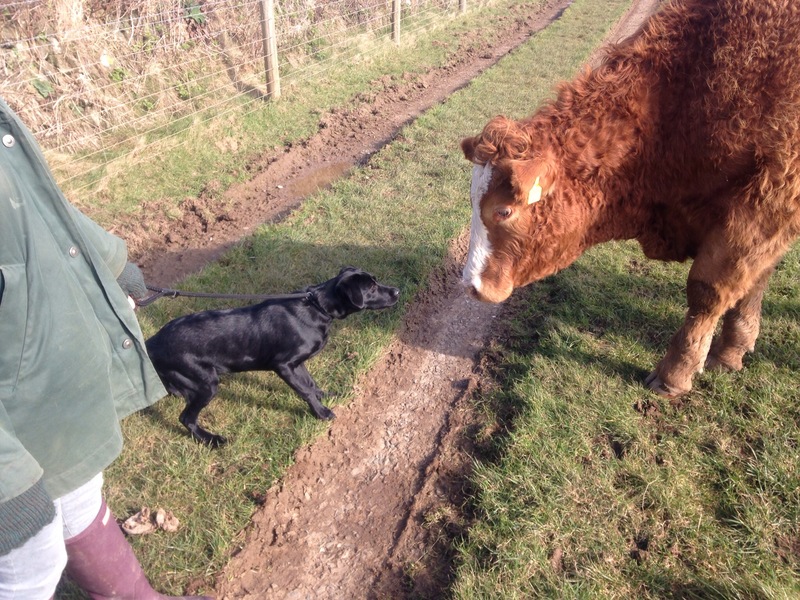 And Skye encountered her first cow! 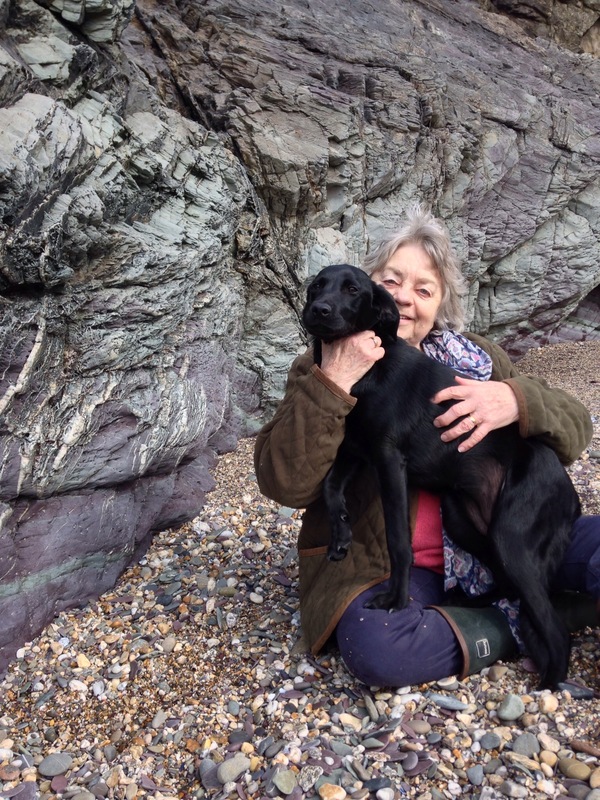 After a lovely, if ever so slightly “Jam & Jerusalem” Mothering Sunday Service at St Endellion Church and a quite simply delicious Sunday Roast at the Cornish Arms in Pendoggett (the best and friendliest Cornish pub there is) we left mum sleeping on the sofa with a slightly sick puppy, and a cat who is beginning to warm to Cornwall and Catherine & I headed down to Greenaway Beach for our favourite occupation of combing the sand and shale for Cowri shells. 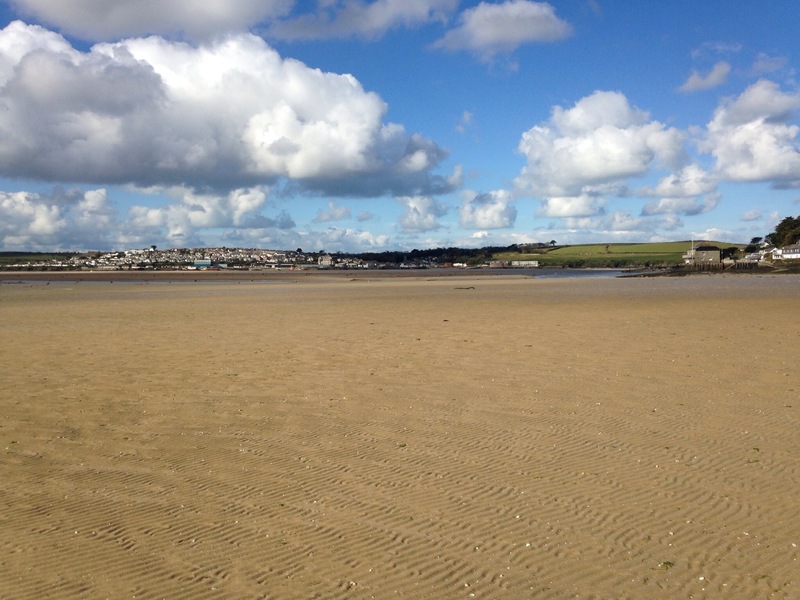 We never tire of this, although the tide didn’t give us much treasure this time, as long as we found more than 10 we were quite happy. 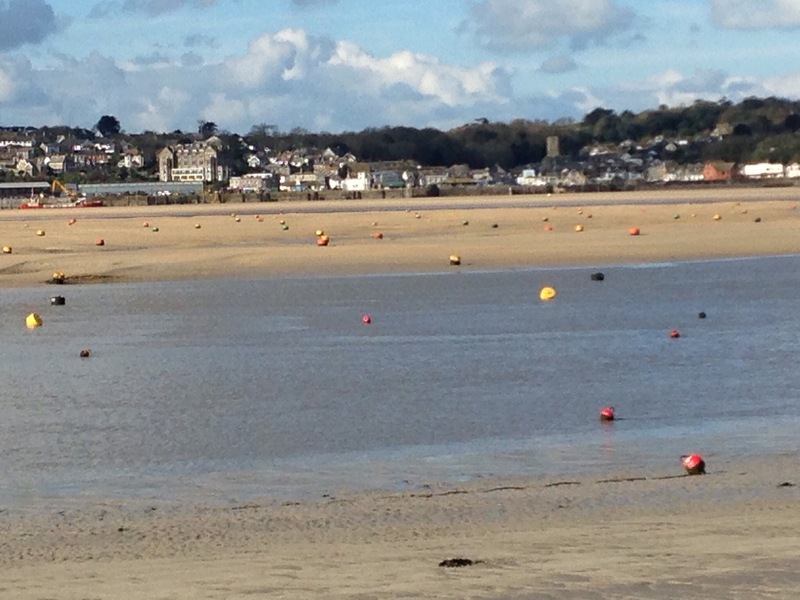 All the coloured marker buoys for yachts and sailing boats that have moorings through the summer months. 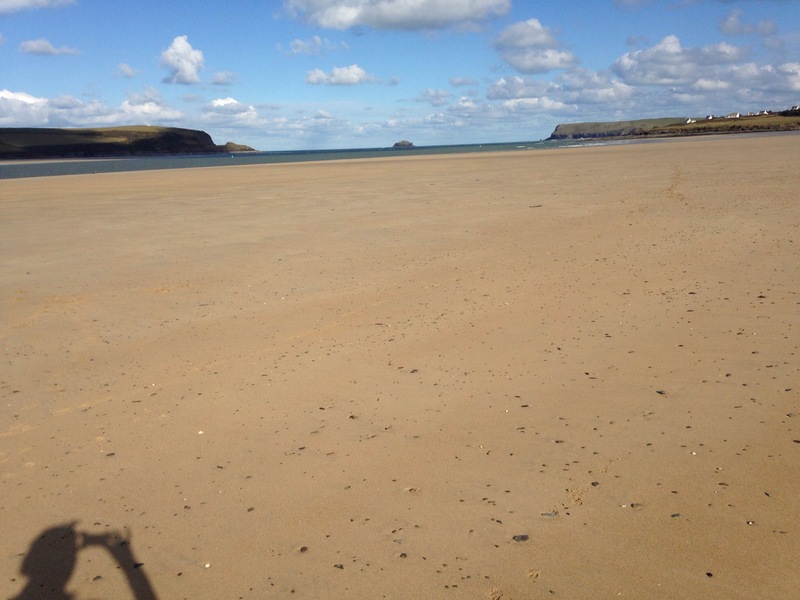 The wide open expanse of sand revealed at low tide running back from Rock to Daymer Bay – it’s so crowded! 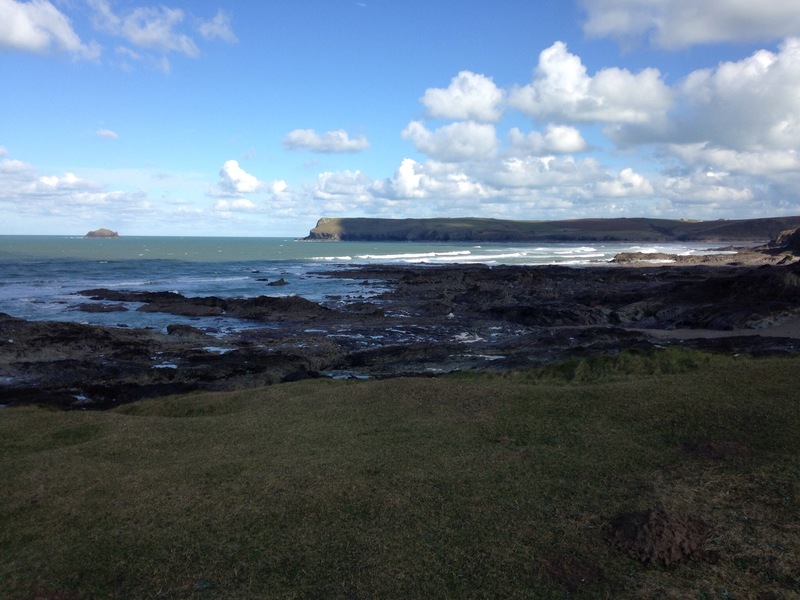 Looking out to sea to Pentire Head from the cliffs out above Greenaway Beach. 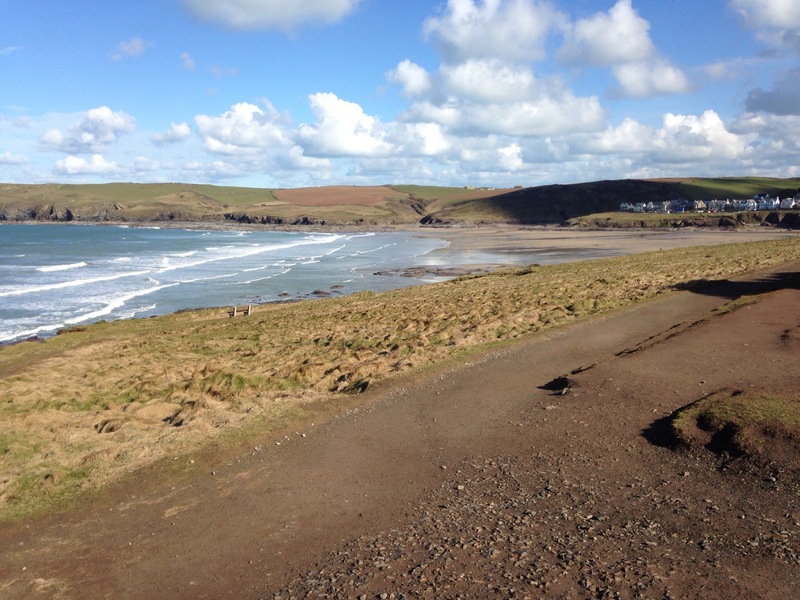 The view above Polzeath Beach. There really is no better place to run, and broken toe or not broken toe (I think it really is just badly bruised and slightly sprained) it is just heaven.